Blue Swedish Duck looking happy to see me! While photographing birds at a pond in Markham last year this duck came out of the bushes to greet me. Referring to my numerous bird guides I couldn't find what kind of duck this was. After a long search on the internet the mystery was solved. 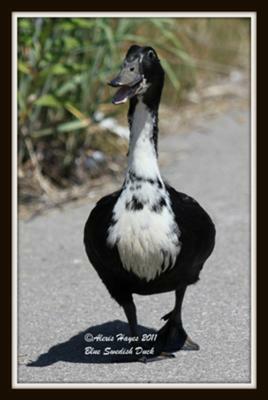 The Blue Swedish is a domestic duck that found his freedom at a pond in Markham, Ontario! Hopefully he'll return again this year. Comments for Blue Swedish Duck looking happy to see me! Thank you so much Franko for taking the time to offer your wonderful compliments on the Swedish Duck and my photography. Also it was extremely nice to hear you have shared this photo with your friends. I took up photography fours years ago and love photographing birds and nature and sharing my photos. Wow that is a perfect click! That duck really seems to be laughing and I have shared this photo with my friends and they also got surprised. I should say you have excellent photography skills. I've seen a few different domestic ducks enjoying their freedom. Another one being a Cayuga about twice the size of a Mallard. A cool looking bird though!